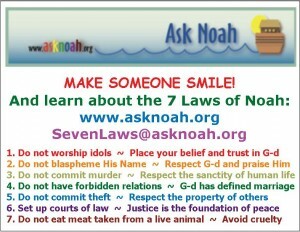 Large-size colorful refrigerator magnet to remind you and your family to be happy and think about the Seven Noahide Commandments many times each day. A convenient and attractive way to learn and remember these righteous laws. A great home teaching aid for children, and a fun way to direct many people to the informative web site www.AskNoah.org. Great for novelty gifts. High-quality, vinyl material. Size: 5.47 inches by 4.21 inches. Cost is $16.00 for a package of 10 magnets. This includes the cost of shipping to locations with the continental USA. Please allow up to three weeks for delivery. 10 magnets, shipped in U.S.A.
To request a price quotation for international shipping, please Contact Us.